The Kensington & Chelsea Labour Local Campaign Forum invites you to our next campaign day, taking place in Chelsea Riverside, one of our must-win wards in the next local elections. It will be held this Sunday 2nd December from 10am – 1pm with a street stall to talk to and flyers to distribute to members of the public. We will be meeting outside the World’s End Estate. Don’t worry if you’ve never been campaigning with us before, this will be an excellent chance to get involved. This Saturday 3 November 2018 is a Labour Party “National Day of Action” and we would be delighted for you to join us. We will be holding a street stall in Earl’s Court, our most marginal ward, from 10am until lunchtime where we will be talking to local residents and distributing leaflets. We are meeting outside Earl’s Court tube station (Earl’s Court Road entrance) at 10am and erecting the stall nearby. We were only 100 votes off winning Earl’s Court in the local elections this year so a continuous Labour presence is vital. We hope you can come and support our “shadow councillors” Bruno de Florence and Sam Batra in the ward. Emma Dent Coad MP and members of Kensington Labour at the anti DFLA march, London, 13 Ocotber 2018. Local resident and local Labour candidate Beinazir Lasharie says “for years many of our local young people have had to go to schools outside the Borough. They will go to school in North Kensington thanks to many years of lobbying by Labour Councillors and local parents”. Yet our Liberal Democrat opponents try to claim responsibility for the new school in their newsletters. We have a track record of achievement and don’t need to take credit for others hard work. We would like to ask for them to exactly just ‘how’ they achieved what they have claimed? The Conservative-run borough’s planning committee decided last Tuesday to allow the 538 social rented houses on the estate to be knocked down over 12 years, to include 300 privately owned homes. This is just another example of just how out-of-touch Borough planning is, when it comes to the community of North Kensington. Labour has backed local residents, who believe that knocking down the estate and displacing 1,700 people, to make way for an additionl 300 private homes fetching £300,000 for a 1 bedroom and £1.2 million for a town house, effectively ruins our community for a decade. At the committee hearing, all of the Labour Councillors opposed the redevelopment and sided with the majority of residents. It is worth noting that every single Councillor that voted in favour of redevelopment were Conservatives. Even though North Kensington remains largely Labour, with no Conservative Councillors. 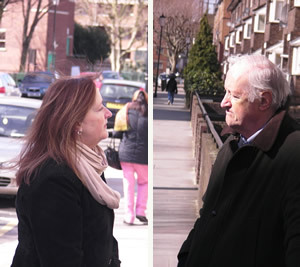 In response, Labour Councillor Emma Dent Coad, invited the architect of one of the 1960s blocks, Peter Deakins, to come down to Portobello this morning and speak about his views on the redevelopment plans. Colville Ward candidate Amir Akhrif, was there to film the interview. If you’d be so kind, do us a little favour next time you look at your street, whether you live on an estate or not. Ask yourself one simple question… “do you feel secure that the Council will protect your home against property developers?”…. After the Council’s decision last Tuesday, we don’t feel secure anymore. That’s why we need Councillors who can sit on these committees and make decisions that listen to local peoples views. That is what Labour intends to do. That is why we are standing for election in May. That is why we are asking for your vote. We’ll be collecting price comparisons for various everyday items from Portobello Market, and pitching them against the high street names. Because we want to promote the value for money of Portobello to more locals. 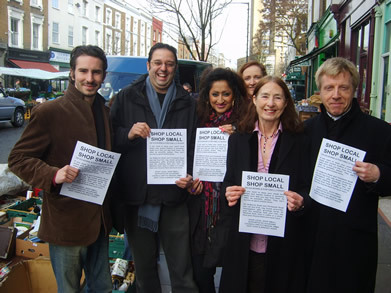 We’ll be developing a poster campaign in as many Portobello shops and stalls as possible to remind everyone to ‘Shop local… Shop small…’ Because sometimes we all need reminding. We’ll be delivering a price comparison leaflet to thousands of residents in Colville Ward. Because we want to advertise some of the savings residents can make by shopping on the ‘bella versus the high street names. Every extra pound we as local residents spend on the market goes some way to helping to protect it. That’s the impetus behind the campaign and that’s us “putting our money where our mouth is”. For the last few years, residents of the Wornington Green estate at the top end of Portobello Road, have been fighting plans by Kensington Housing Trust to knock down 538 socially rented homes, before building 500 private and 538 socially rented homes on the same site. Effectively doubling the population density. Tonight, Conservative Councillors decided to give the housing trust permission to go ahead with the development, which will displace almost 1,000 residents over the next 12 years. Leader of the Labour Group Judith Blakeman and Colville Ward Councillor Kieth Cunningham stuck to their guns, and made powerful arguments which swayed 3 Conservative Councillors to oppose the plans and vote with Labour. Unfortunately, the majority of Conservative Councillors voted with the housing trust’s plans to knock down the estate. Critical issues that Labour raised during the hearing, included questions over: (a) how extra frontline healthcare and primary school places will be provided to accommodate the doubling in the population (the housing trust couldn’t answer); (b) why the square meterage of green and community ameinity space provided is effectively being halved on a per person basis (the housing trust couldn’t answer); (c) whether the housing association could fulfill its commitment to allow social housing residents to come back to the estate, if the number of bedspaces and floorspace is being cut (the housing trust couldn’t answer). When it came down to the vote, it was 5 in favour of the development and 5 opposed. But it was the Conservative chairman of the Committee that used his chairperson’s casting vote to allow the plans to go ahead. We believe that a housing development affecting around 1,700 residents is too important to be left to the casting vote of a chairperson. Not after a hung vote, and certainly not after so many residents’ objections. We believe that power must remain with the people, not with property developers. We need to make sure estates all over North Kensington are protected, and are not just seen as fair-game for development. So, what’s the next step? What can we still do? Well, Labour doesn’t give up that easy. We’ll be contacting the Mayor of London tomorrow morning (although technically, it already is ‘tomorrow morning’). He’s the only person that can put a stop to it now… Don’t hold your breath though, a Tory is a Tory.